Old buildings often contain hazardous materials in places you may not think about. That’s the case in the Cornell Mill in Falls River, MA., which is undergoing a renovation. The former cotton mill, built in the late 1800s, will become 101 market rate housing units. The granite building has some great features like hardwood flooring, granite counters, easy highway access, and huge windows. Those big windows, however, include an asbestos-containing window glazing. The windows will be removed by Banner Environmental to ensure safe and legal remediation of the hazardous material and to prepare for the new window installation. Window glazing is the caulking or putty applied to the glass pane that attaches is to the frame. The Cornell Mill is a very large building – 4 stories tall, 192,000 square feet – leaving plenty of room for lots of windows – 308 to be exact! But this is nothing new for Starr Development, who is taking on the renovation, not their first of a former mill. 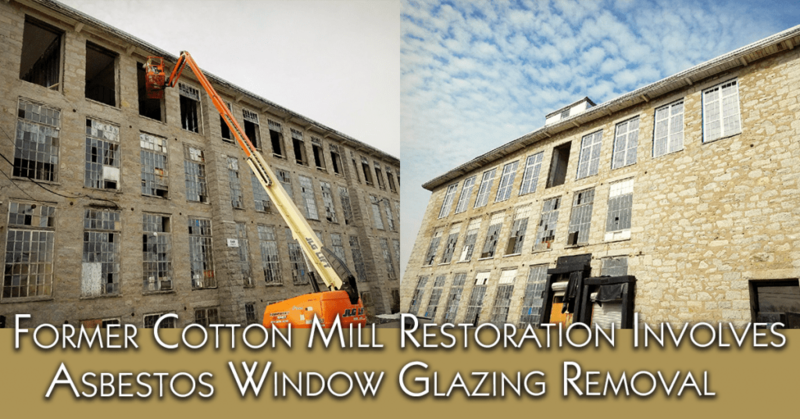 Old mills lend themselves nicely to housing renovations due to their large window openings. In the meantime, Banner Environmental will complete the asbestos window glazing removal so that the developers can continue their project and provide safe housing.